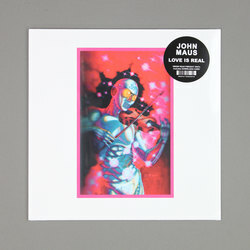 John Maus - Love Is Real. Vinyl LP. Bleep. To coincide with the release of John Maus’ latest full-length Addendum, Ribbon Music have nabbed the rights to a couple of his early tomes. Love Is Real, Maus’ second LP, was originally issued in 2007 via Upset The Rhythm. The album expands on the Gothic bedroom pop of its predecessor Songs, maintaining the murky Baroque flavour of Maus’ debut while also drawing more strongly from the worlds of synth-pop and darkwave. The influence of his good pal Ariel Pink also shines through on cerebral hypnagogic cut ‘The Silent Chorus’. With hindsight, it’s easy to draw a triangle between this era of Maus and both the early and recent records of Nick Cave & The Bad Seeds.